This may be the strangest repurposing project you’ve ever seen. 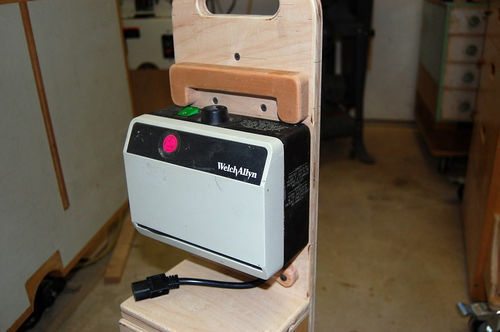 A Power Supply / Light Source Box that weighs 5 pounds. If you find one of these, just remember that it is a great source of light. To be useable in the shop the light tube (which plugs into the box just to the left of the green switch in the above picture) has to be pointing up. 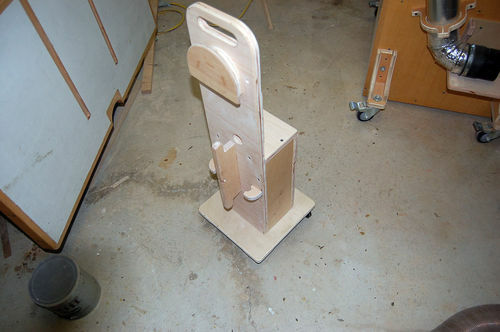 The solution was to make this little mobile stand. The light tube port on the power supply/light source box had to be located about 27 inches above the floor so I added the 3 little drawers beneath the light source box. Never too many drawers in the shop. It also added weight to keep this from tipping over. Under power supply/light source box location is a hole through which the power cord exits out the back of this mobile stand. 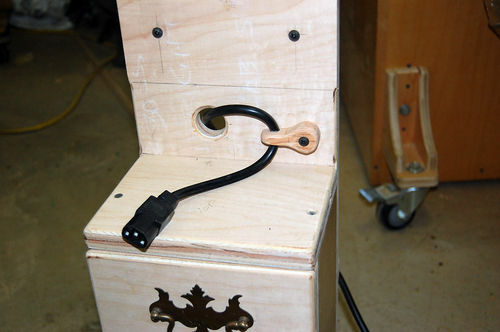 A wooden cord clamp serves as a strain relief for the cord. 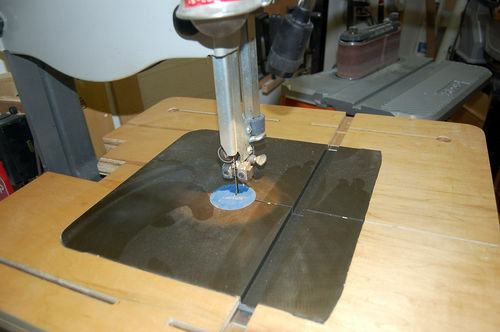 The light source box keyhole slots are placed over 4 screw heads and pushed down to lock in place. 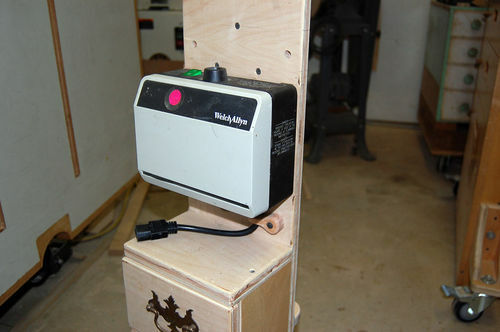 This is the correct position of the power supply/light source box. The power cord is plugged in first. The light tube is pushed in the cone shaped bump on the top and removed by pulling it out. Pulling out the light tube may unmount the light source box from the keyhole screws. 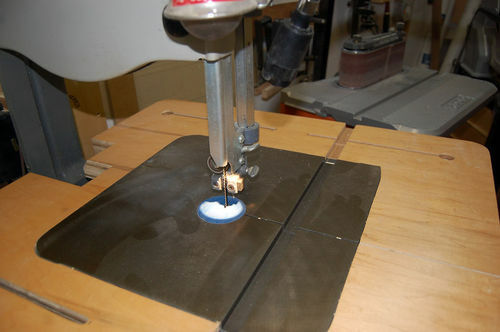 A upside down U-Shaped lock that has 2 dowels glued into it is pushed into placed in 2 predrilled holes. This lock is easy to install and remove. This is the back of the stand. 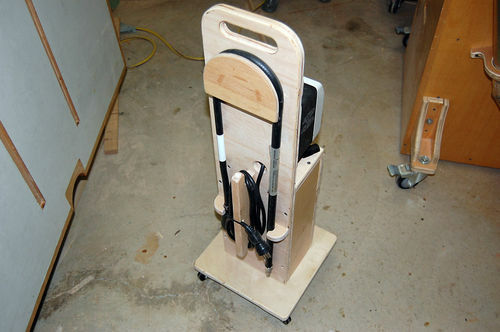 It has a light tube storage area and a cord wrap to store the cord. This is how it looks with everything stored. Casters are all swivel light duty 1-1/2 inch plate mounted. Here is the light in use. The light can be either a SPOT of light or …. Comments encouraged and questions welcomed. Cool! 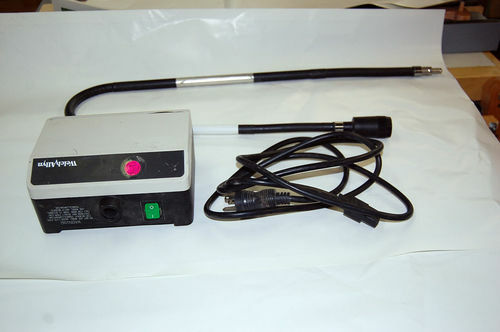 Now to find a friend willing to part with such equipment—actually it will have to be a hospital administrator since they have bought up all the local practices. Nice Idea ,will have to check at the next surplus auction . This would be hany in a lot of places . That light really gets into some tight places. As a former Medical equipment repairman in the Air Force, I have to wonder what the heck this light was actually supposed to be used for. LOL. You’re very adept at making the best of what you have to work with. Handy little light and cart, Alex. No, you are not the only one that needs more light! Wild and crazy idea .but it looks like it works. This looks great. Good lighting is a real asset in a shop. Hope its clean lol great re-use…. Man can never have enough light. 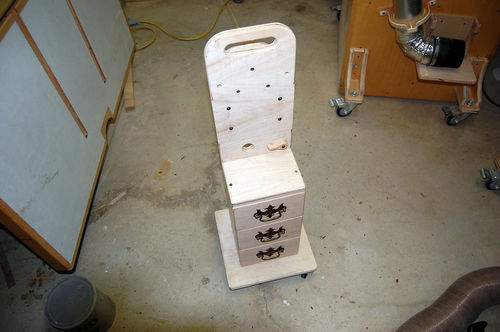 And just think … If you ever get tired of woodworking, you can start your own Gynecological Examination Company. You already got the light! I had a good friend give me one of these as well. 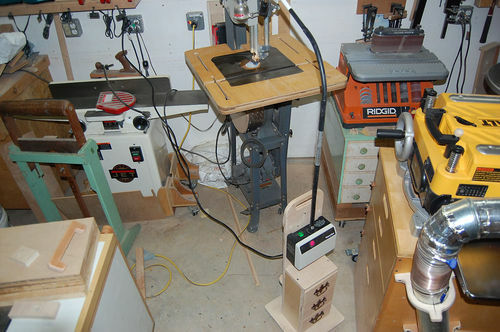 I have been using it for my lathe but I really like to mobile option. I was very curious if we had the same friend but I did not see him in your buddy list. Anyways great cart and I will be stealing this idea just as soon as I have time. Thanks for sharing!